19 February 2019 (Toronto, ON) - 2 Chainz, the multi-platinum, Grammy Award®-winning MC and “One of the Very Best Rappers Alive” (Noisey), confirms his highly anticipated fifth studio album, RAP OR GO TO THE LEAGUE, A&R'd by LeBron James, is set for March 1st release via Def Jam Recordings/Universal Music Canada, the country’s leading music company. 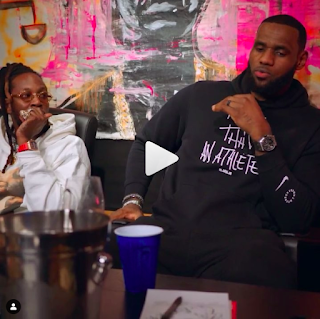 The countdown to March 1st is officially on, as Apple Music rolls out the first trailer for 2 Chainz x LeBron James RAP OR GO TO THE LEAGUE, an exclusive in-depth conversation between two of the biggest titans in their respective fields. As long-time friends and fans of one another, 2 Chainz and LeBron represent the true intersection of music and sports. In addition to music, 2 Chainz' cultural influence continues to grow. Earlier this month, he starred alongside Adam Scott in “the world’s first Super Bowl commercial you can expense” for Expensify. Chainz’ wildly popular TV show Most Expensivest on VICELAND moves into its third season in 2019 with 20 new episodes (season premiere TBA); view the series trailer HERE. Chainz’ sneaker collaboration with Versace called “Chain Reaction” hit stores in the spring 2018, and was their most popular shoe of the year. In October,2 Chainz launched his own cannabis brand, GAS Cannabis Co. available now throughout California HERE. Following his run as a founding member of Def Jam duo Playaz Circle from his native Atlanta, 2 Chainz’name was on everyone’s lips in 2012, when he stole a verse on “Mercy,” fellow Def Jam artist Kanye West/G.O.O.D. Music’s RIAA triple-platinum #1 R&B/#1 Rap hit (from Cruel Summer). In August 2012, Chainz arrived as a Def Jam solo artist with Based On A T.R.U. Story, his debut album. B.O.A.T.S. entered Soundscan at #1 and was certified RIAA gold. Its success was fueled by the RIAA platinum #1 “No Lie” featuring Drake, the double-platinum “Birthday Song” featuring Kanye West, and double-platinum “I’m Different.” “Mercy” was subsequently a Grammy® nominee for Best Rap Song and Best Rap Performance, while B.O.A.T.S. was nominated for Best Rap Album. Chainz’ dominance was extended when the sequel, B.O.A.T.S. II: Me Time entered the Soundscan hip-hop chart at #1 in September 2013, and spun off the RIAA gold single, “Feds Watching” featuring Pharrell.